Saddened by the death of Robert Mann. A founding member of the Juilliard String Quartet, Mann was its first violinist for decades as well as a master teacher and composer: his melodramas are memorable pieces. Countless quartets benefited from his guidance. Mann was one of the finest musicians I ever encountered. I am truly glad that he was active during my time at Juilliard. 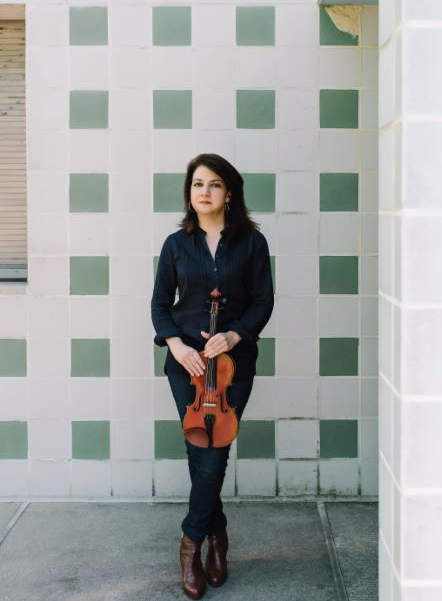 Tonight at 5:30 PM, Miranda Cuckson presents a pop-up concert at Miller Theatre. Works by Michael Hersch, Steven Lehman, and Aaron Kernis. Charlotte Bray’s music displays steely determination and an expansively colorful textural palette. Her NMC portrait CD supplies an abundant view of these characteristics. The title work is particularly impressive; it is filled with piquant yet often spacious harmonies, frequent juxtapositions of orchestral groupings, and lithe pacing. Mezzo-soprano Lucy Schaufer approaches Fire Burning in Snow, settings of poems by Nicki Jackowska, with clear diction and an emotive presence. Likewise the players from the Birmingham Contemporary Music Group give detailed precision to the work’s angular intervals and supply intensity to the nuanced dynamic shadings found in the accompaniment. Soprano Claire Booth, ably accompanied by Andrew Matthews-Owen, brings expressiveness and considerable beauty of tone to Songs from Yellow Leaves, settings of Caroline Thomas’s poetry. Pianist Huw Watkins pulls double duty on the CD, deftly inhabiting the alternately shimmering, sprightly, and strenuous atmospheres of the solo work Oneroi. There are far more episodes possessing the latter demeanor in the piano concertino Replay. However, the variety of timbres found in the chamber ensemble’s accompaniment keeps the work from becoming overwrought. Explained in part by its title, the piece also contains considerable motivic repetition and development: an attractive addition to Bray’s arsenal of resources. The two-part chamber concerto Caught in Treetops is similarly endowed with an enriched template of motives, ranging from repeated note flurries to widely spaced arcing lines. The work begins with a cadenza, introducing sterling soloist Alexandra Wood, a versatile and formidable violinist. Only gradually is the chamber ensemble invited in, filling the gaps with contrapuntal lines and forceful tutti. While Bray’s language remains primarily a chromatic one, Part Two of Caught in Treetops contains the addition of some beautiful, delicately announced harmonic verticals. The gentle close of the piece provides a perfectly enigmatic twist to the CD’s program, leaving one eager for more from this talented composer.